As a teenage convent school girl, I couldn’t get enough Mills and Boon, those English emperors of romance publishing. I read everything they had, cover to cover. And then, as I grew, I forgot about the dashing heroes within the pages of these novellas, and settled for a different reading regime. And Mills and Boon drifted inexorably off my radar until, quite by chance, I was back in the land of swarthy landowners and highly accessible farmhands. It was at The Museum Of Rural Life, run by those nice academics at Reading University, that I wandered out of the main exhibition space, away from the lathes and scythes and manly mallets, and through the corridors of the worthy old mansion in which it is housed. It was when I happened, unexpectedly, upon the great mahogany stair of the house, that I was lost. Lost, completely, to its masterful charms. Nestling in the well of the staircase were cases and cases, all crammed with vintage Mills and Boon. Reading University has only just acquired the Harlequin Mills and Boon Archive as part of its special collections. And if you wander deep into East Thorpe House, the home of the museum-mostly dedicated to farming and village life- you can glimpse the very beginnings of what has become a scarlet literary dynasty. They began, back in 1908, as a general publishers. Gerard Mills and Charles Boon set up in Richmond, veterans from Methuen, and they didn’t limit themselves to bodice-rippers. 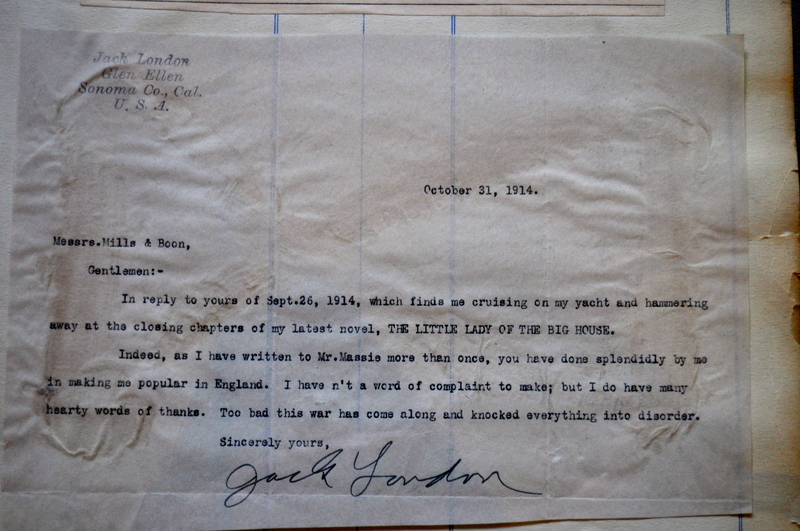 In fact, both PG Wodehouse and Jack London were under their auspices. They published all manner of books: my favourite has to be Life Without Servants: The Re-Discovery of Domestic Happiness, by A Survivor. And then there’s A Chauffer’s Companion. In 1928 they came close to ruin, and decided to concentrate on the genre which would guarantee an enduring and not entirely critical readership: romance. They were by no means the first to propogate the romance novel. There was Samuel Richardson, and the Brontës and Jane Austen. And like their predecessors, Mills and Boon were canny: during the 1930s they courted the libraries and became a ‘library house’, publishing directly to these bastions of the lent book. And their availability increased their circulation manifold. Mills and Boons are like the catnip mouse with which the cat plays: a piece of theatre in which a reader is willing to suspend disbelief. We know these novels are not subtle, but we don’t care, because we are in the mood for mind candy, and read it we shall. This collection takes one on a journey from 1917 to 1994. It traces changes in fashion, in the woman’s place, in morés, in worldly wisdom. Housewives change, over the years, to go-getting career women; demure subjects become voracious huntresses. Today Mills and Boon is said to publish to three million readers in the UK annually. We are affectionate towards them. And their philosophy – spoken by the son of founder Charles Boon, John, who became MD in 1964, speaked volumes: “You see, we never despised our product,” he said. “I think this was highly important. Or, translated into the words of M&B author, Violet Winspear: “The real aim of romance is to provide escape and entertainment, not to dish up ‘real life’ and ‘real life people’ on a plate with egg on it! Posted in Places to visit, WhimsyTagged Harlequin Mills and Boon, Mills and Boon, publishing, Reading University, Romance, writingBookmark the permalink. 24 Years of Cricket might be an interesting read :-). If you say so, Steven…. That was a bit tongue in cheek 🙂 For an American boy. Over time I’ve lost or given up virtually every book I had as a child. It’s not that I’d read them again, but just that I’d like to have some of the books I read then. I do still have my copy of Black Beauty. Hurray! And your collection never included any romance novels, PT? The wife of one of my yachting competitors was a Mills and Boon writer. She told us how strict the bounds had to be on each novel before they would be satisfied with it. I have heard it is so. But I believe the rewards are well worth it if you get the formula right! She did seem to do OK out of it! In fact, she Googles: Gwen Westwood, with novels like Bride of Bonamour, Ross of Silver Ridge, and Safari Heartbreak. Ooooh! You are well-connected, Col! M&B don’t publish bodice rippers. I believe they’re a bit sexier than they used to be but they don’t go that far. I tried writing one once, thinking it would be a doddle. It was so NOT a doddle. And I know they have strict criteria that authors must follow, as Col said. Thanks for this trip down a happy memory lane. I too thought they’d be an easy write. Not though. There was a documentary on a few weeks ago about a novelist attempting her first Mills and Boon. Rather amusing! I have written a couple – have to get back to revising for publication. Fascinating post! I must say that i don’t believe that I have ever read a romance novel. As a young boy and teen, I was into sports books of all kinds and then moved on to hard science fiction such as Asimov. Have always been a fan of espionage thrillers and murder mysteries, particularly Ludlum and the Queen of murder, P.D. James. Life Without Servants – now that sounds a rivetting read. Written by A Survivor. Yes, Jim, that would be favourite. How does one ever manage without them? The covers of those books remind me of the covers of the Nancy Drew mysteries I so loved as a child. I wonder how my accommodations would appear if every book I’d ever read suddenly appeared to take up residence with me. Better, I expect, to carry them within, eh? Yes. Though I do become outwardly covetous of a few books. “How to Manage Without Servants’ would be just such a book, Nancy. I had no idea Mills & Boon ever did anything besides bodice rippers. I also didn’t know they went back so far as a publishing house, I assumed they were like their American counterpart, Harlequin, a (relatively) recent thing. There you are, Weebles. Undiscovered history strikes again,. LOVED Mills and Boon’s novels. My dad forever called them my “Milton Boones” – don’t know where he got that name, but you brought him to mind with this post! I love that 🙂 A great name. They are an institution, that’s for certain! Dear Kate, way back in the 1970s when I was dealing with depression and hallucinations, I put aside my liking for what was known as the classics as being too ponderous for my befuddled and muddled mind to read. It was then that I began to read romances and I did so for about ten years. 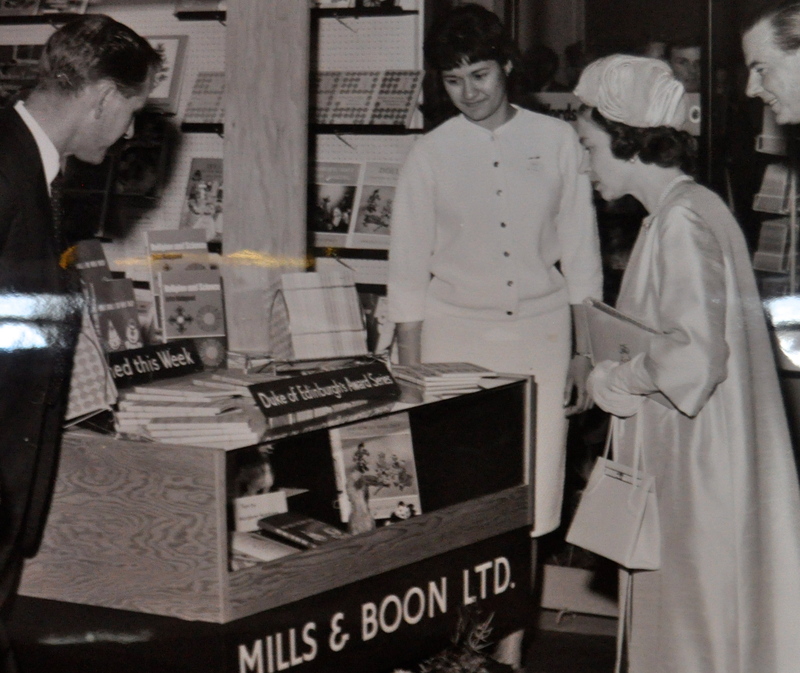 Each month I purchased from the local book store the six new titles from Harlequin–Mills and Boon’s Canadian publisher. Then, in 1978, I traveled to London with an older friend whom I’d introduced to romances. She “loved” them! As did I at the time because when I went to bed at night and let my mind drift it always went to dark and scary places. But if I read a romance that had little relationship to life as I knew it, I could fall asleep. In London, Charlotte and I bought some Mills and Boons books and I still have one I bought there by my favorite writer at the time–Betty Neels. I no longer read romances but I know that they helped keep me sane back in the ’70s. They helped me hold on to life and so I have a warm place in my heart for them. I didn’t read the “bodice rippers,” just the simple romances that ended with the couple planning on getting married. Simple reading for a difficult time in my life. Thanks for this information on the company. You always leave me with more knowledge than when I clicked on your site! Peace. Dee, as always, you add so much to our discussion through your comments. Sometimes we need the simple, engaging stories to fill up the dark corners of the mind. Peace to you too, friend. What an intriguing title, Karen! Makes me want to Google it immediately. Yes, I have wandered off to crime novels. Love PD James and I’m a dyed-in-the-wool VI Warshawski fan. Love heavy stuff like Robertson Davies and Tolstoy and suchlike to. I have a policy: one mind-candy, followed by one heavy. That way I keep balanced. Ah, yes, these days Mills and Boon has become once more fashionable to study, a much for what is says about womens’ places and attutides as for its artistic merit. Fab stuff. I received a box full of books today from ThreeWellBeings aka Debra Fetterly, and I cannot wait to devour them. I suspect they will be similar to Mills and Boon. Hurrah. There is such a place for them, Andra: I reference Dee’s comment above. They have a place in chasing away the darkness and sadness from the corners of a mind. I’ve never read a romance novel in my life. I completely lack that gene. You are fortunate indeed, Lame. P. G. Wodehouse and romances from the same publisher–such possibilities: I have a vision of Bertie Wooster innocently wandering into a bodice ripper, stammering an apology for accidentally ripping the bodice, and running for Jeeves, who prevents Bertie’s being sued for breach of promise. My own teen favorites were Victoria Holt, Phyllis Whitney, and the classy Mary Stewart. Wealthy, handsome, mysterious widowers and Jane Eyre-ish governesses and sad, unloved children, thrown together in castles in Cornwall. I planned to name all my future children things like Connan and Kerensa and Mellyora and Phillida. Your post has certainly brought back memories! Wonderful stuff, Kathy. Have you come across Elizabeth Gaskell? They have their quaintnesses, these tomes, Roger 🙂 Best not to visit this land overmuch, though. Me too, BB, though there were times when a plate without was just what the doctor ordered. What a wonderful attitude. Devoting oneself to making another turn in their grave ;-D Made me chuckle, Myfanwy! Writing for them must be a lucrative business! I think far more now of Mills and Boon than what I did.. Thank YOU!! Oh, Kate… you’ve come knocking on my literary door! I had no idea, though, that my personal philosophy and John Boon’s were so closely aligned. Oh yes, Mr. Boon. Oh, yes. Cameron, it does my heart good to read this. We are put on this earth to fulfill a destiny, and romance writing is just such a destiny. And you do it with class. I suppose you would never consider writing for these giants? Now that is a compliment! I have ruled exactly nothing out in terms of where I’d like to see my manuscripts go! Love those book covers, Kate. I “discovered” Nancy Drew books when my granddaughter began reading them and the changes in how she was portrayed on the covers was fascinating. Again, like the Mills and Boon books, the character changed to meet the times.